JD Dunne knew he was going to die. He looked from the wiggling puppy in his arms to the barrel of the Colt .45 centered on his chest. A flash exploded from the muzzle and he felt himself being hurled back against the side of the wooden building and he hung there, numb, looking down at the spreading circle of red on his chest. Something caught his attention, and, looking up, he watched Billy running toward him, Buck right on his heels. Both the boy and Wilmington appeared to be moving in an unreal, too slow way that confused him, and JD wondered if he would still be alive when they finally reached him, let alone when Nathan finally got there. "JD!" Buck yelled as the young sheriff's knees buckled and he began to slide down the rough wall. He was about to hit the ground when he felt Buck's arms wrap around him. "Ah, kid, what've ya done?" "Sorry, Buck," JD managed to choke out, looking up into the tear-filled blue eyes of his friend and mentor. "No!" Wilmington cried as he shook him. JD felt his eyes slide closed. "JD, damn it! You can't die on me, kid!" "JD?" he heard Billy call hesitantly. JD was wide awake and fighting for a breath, his chest tight with fear. Sitting up, he wiped the sweat off his face with a trembling hand and glanced over at Buck. A wave of relief rolled over him; the older man was still sleeping peacefully. Climbing restlessly to his feet, he dressed and left his friend, sneaking out of the boarding house and walking down to the corrals at the livery to think. It was the fifth night in a row that he had been jarred awake by the same dream cutting through his sleep and driving him awake in a fist of fear and panic. He was losing sleep and getting short-tempered as a result. He knew Buck and the others didn't understand why he was so moody, and he couldn't find a way to explain the dreams to them. He wished fervently that he could just get a hint of why the dream was recurring and, more importantly, why it scared him as much as it did. He had faced more dangerous situations than he cared to recall, moments when he or any of the others could have been killed, yet this particular dream scared him more than anything he had ever faced. right. Like it's destined to happen and there's nothing I can do to stop it. I don't want Buck to see me die like that, he told whatever God there might be out there who would hear him. Whatever has to happen, please, Lord, don't make Buck a part of it. He'll just blame himself. Maybe he had taken the things Vin had taught him about dreams too much to heart. The young sheriff heard footsteps and cursed silently. Buck was just about to discover another night of JD's sleep had been cut short yet again. "JD?" came Wilmington's voice, low and questioning. Yes, he'd noticed. "Over here, Buck," JD called softly. Damn. Sooner or later I've got to tell him about this. He's going to think I've gone loco, and I don't blame him one bit. The ladies' man joined Dunne, a blanket hanging loosely over his shoulders. "JD, what's wrong? You see somethin'?" The sheriff turned to answer, knowing Wilmington would notice the growing dark shadows under the younger man's eyes, accentuated in the pale moonlight that cast its eerie glow across the desert. "Naw, I just wasn't tired," JD lied. "Why don't you go on back to bed? I just want to stay out here a while, then I'll come back and get some more sleep too." The young sheriff cringed at the tone. "Damn it, Buck, I just"
"JD, what's wrong? You haven't slept more than a couple of hours the last few nights. You're not still blamin' yourself for"
"I didn't realize I've been keeping you up," JD responded grumpily, wanting to avoid the issue. "You ain't sick or somethin', are you?" Buck asked, stepping up and pressing his hand to the younger man's cheek. JD ducked out from under the man's touch. "No. Not like you're thinkin', anyway." Walking over to the old chair outside the livery entry, JD plopped down onto the dusty seat. Buck joined him, leaning back against the building and waiting. Dunne began, hesitantly at first, but finally explaining the content of the dream in general terms, unwilling to face it again in detail. "JD, what you need is a few quiet days away from here. You could go out and stay at Nettie's. You and Casey can spend some time together," Buck told him when JD finally fell silent. "Someplace where you ain't got ta be the sheriff, someplace with a soft bed, and a pretty little gal. Or, better yet, I know about this sweet little town  got the prettiest gals, just waiting to make you think you'd done died and gone to Heaven. We could ride out for a day or two." JD smiled thinly and nodded. I wish I thought it was that simple, Buck, he mused, but he said, "I'd go for that. You have a particular sweet little town in mind? Hope it don't turn out to be like Wick's Town"
Buck grinned. "Better 'n Wick's Town, kid. Far, far better. It's called Kismet." JD nodded; he'd heard some of the other men in the saloon talking about the new whore town that had sprung up after Wick's Town went out of business. "How far?" he asked the ladies' man. "Well, about a day's ride north of here, if it's still where I think it is." JD thought for a moment, his forehead wrinkling. Maybe if he got away, he could avoid the confrontation that was looming from his dreams. He nodded. "All right, I'll go." "It's settled then," Buck said with a satisfied expression. He shifted, pushing away from the wall of the livery. "We'll take us a ride to Kismet. That's all you need, JD, a little rest. Hell, if we keep gettin' every damned bank robber, rancher and bandito passin' through much longer, I'll probably start havin' loco dreams, too. You just need some time someplace quiet, that's all. Your mind's always workin', kid. It's time to give it a rest." JD nodded as he stood again. "Sounds good, Buck." They walked back to the boarding house and climbed the stairs to the room they shared. Each man climbed into his bad and within minutes the soft sound of Buck's breathing washed over the youthful sheriff, lulling him back to sleep. The dream did not return. A cold chill snaking through his chest left JD shivering despite the desert heat. He watched the little blond boy, unable to look away, as he hurriedly toted a gangly puppy toward town under one arm, stroking its head with his free hand and talking softly. He glanced over at Buck, but the ladies' man's attention was on a pretty blonde girl passing by in a buggy. Lord, I can accept that it's my time to die, but I'll ask you again, please, make sure Buck doesn't see it. Please? He's seen enough death in his life. He doesn't need to see mine, too. And watch out for him when I'm gone. He's going to need it. The sense of dread grew stronger as the two peacekeepers rode down the main street of the whore town. JD recognized it as the same town in his dreams, but he remained silent. If I'm going to die, there's no use worrying Buck about it now. There's nothing he can do. Nothing either of us can do. Guess it's just some of that Fate Josiah's talking about. JD allowed Buck to lead the way to the saloon that dominated one corner of the tiny, and only, cross street. The odd stillness of the town set JD's nerves on edge, and he wondered why Buck hadn't noticed. Buck watched his young friend from the corner of his eye, worried. It wasn't like JD to let a dream bother him so much. There had to be more to it than the kid was telling. Well, he decided, we'll get us a bath, and a soft gal and a few nights of some real fun and he'll be fine. But Buck couldn't force himself to believe it. They dismounted and stepped up onto the poorly constructed, warped boardwalk. Buck paused, looking carefully around. "It seem a little quiet to you?" "I was beginning to wonder if it was just me. Sure is a lot quieter than Wick's Town was." Buck nodded his agreement. "What do you suppose is goin' on?" "Don't know, but I sure don't like the looks of it." "I'm gettin' a funny feelin' about this, kid." The young sheriff was about to comment when they were joined by a man who stepped out of the saloon. "Welcome to Kismet, boys!" he greeted. "Why don't you join the rest of us inside?" The two peacekeepers exchanged glances, then followed the man into the saloon. Buck's hand rested lightly on top of his holstered gun. JD quickly glanced around the interior. There had to be at least thirty people in the room, some playing poker, some drinking, and more engaged in animated discussions. Girls sat in various customers' laps, smiling and occasionally giggling. Buck had to grin at the sight. Now, one of them might improve JD's disposition! "What's the problem here?" came a voice, and the peacekeepers turned to see the bartender motioning to them to join him at the bar. "No problem, friend," Buck replied cautiously. The big man grinned. "Guess ya ain't heard. Clyde Keever and his men out at the Muddy Pup Mine hit a vein of silver yesterday that's gonna make the Comstock look downright puny! Darn near the whole town's out at the mine, celebratin'. We're just waiting for them to get back to town, then you're gonna see a celebration the likes of which will never be repeated!" Buck nodded. That explained why the place was so quiet. Maybe he was just looking for things that weren't there. He forced himself to relax as the high spirits of the remaining girls and customers began to wear off on him. "Guess there'll be some good poker games when they get here," JD said to Buck. "Ezra's gonna be sorry he missed it." "Good? Boy, people are gonna be playin' with lumps of gold tonight!" "Gold?" Buck questioned. "I thought you said it was a silver strike." The bartender laughed. "And it was, it surely was, but you know what I mean!" He turned, calling out to all of the customers, "Next round's on me!" A pretty brunette sidled up to Buck, slipping her arm around his. "Hello, handsome," she greeted just as a petite blonde latched onto JD. "Hello, darlin'," Buck greeted, starting to grin. "Why don't you let me buy you a drink?" The two peacekeepers headed over and took a room in the hotel, one of the few wooden buildings in town, knowing that they had better get a room before the news of the strike had the town of Kismet crawling with prospectors and miners. Then they spent a portion of their wages on a bath and shave at the barber's, then another on a huge steak in the hotel's dining room. JD's spirits were lifting, and Buck knew that he was thinking about the pretty little blonde he would be meeting later that evening. The ladies' man smiled. Yep, this was just what JD needed; something to get his mind off of Annie and whether or not he'd done the right thing, staying with us. The saloon was in a state of total confusion. People crowded around the bar and tables and spilled out the doors. Occasional sounds of gunfire interrupted the goings-on as drunken miners scooped up the girls, twirling them out to celebrate in the streets. Buck and JD basked in the safety of the back corner of the saloon, knowing they already had their ladies lined up for the evening. Playing poker with a few of the miners, Buck had already built up a sizeable pile of winnings and silently thanked Ezra. It appeared the gambler's luck had rubbed off on Wilmington. And JD wasn't doing too badly either. The miners, half-drunk and willing to bet on practically anything, were easy targets for the sober regulators. Buck watched JD glance around like he was back in Four Corners, and taking his title of sheriff a little too seriously. Damn it, kid, relax. What could go wrong? JD met his friend's stare across the table. He grinned. I know you're still worried about me, Buck, but if I'm going to go to my last reward, I'd like to see it coming. It was nearly dawn before the girls were able to find them and the two men called it a night, as far as the gambling went anyway. The rest of the town was still in high spirits and appeared ready to carry the celebration forward for another day  if the whiskey held out. Buck and JD stood and stretched, the girls moving up to attach themselves to them. "Ohmygod! Fire!" one of the saloon girls cried. "There's a fire!" Silence fell over the crowd in the saloon, then someone began barking out orders for buckets and shovels. The building emptied as men and women ran to stop the blaze before it destroyed the entire town. Buck and JD followed the rest of the locals out into the street, ready to help. Buck felt JD move away, but was unable to take his attention from where he was tossing buckets of water on the saloon, now almost totally engulfed in flames. He coughed and tried to wipe his eyes on his sleeve as a blast of smoke and heat erupted from the building. Where the hell's the kid going? JD bumped into a woman at the back of the saloon where he was about to ask the storekeeper about there being some dynamite in town. Her panic-stricken eyes caught his. "My little boy!" the woman cried. "Please, please, where's my little boy?" The woman looked a little like Mary Travis. "You lost your son, ma'am?" "Please, you have to help me!" she wailed. "No one will help me find my son!" "All right, I'll help you look for him," JD said, trying to ease the woman's panic. "Take me to where you last saw him, understand?" The woman nodded and began running down the alley that separated the saloon from what was labeled the mercantile. She stopped. "Here!" she cried. "He was right here!" She raced several yards down the alley, calling for the child. JD glanced around, but didn't see a child. Then, through the warped planks of the storeroom, the young sheriff saw the little boy trying to coax a puppy to him as the thick smoke of the fire swirled around them. He brushed past the woman and into the walkway. The blond boy looked up as he approached, looking very much like Billy Travis. "Please, mister, please get Bartholomew!" He pointed to the puppy. JD moved forward, ready to grab whatever presented itself, and scoop the puppy up. But Bartholomew had his own ideas. Instead, he ended up with a handful of dust and the pup hiding under the corner of the wooden building that was rapidly burning. Smoke blurred JD's vision, but he ignored the tears as he tried to reach under the building and grab the little boy's pet. Sounds of the child crying and his mother's voice echoed over the commotion from the front of the building. The little boy screamed as a portion of the building collapsed and the puppy raced out from its cover and straight into JD's arms. "JD!" he heard a voice call and looked around for Buck. The puppy struggled in his arms, biting at the young sheriff's hands as JD spotted several men, their guns drawn. His attention was immediately captured by the circle of the barrel, trained on his chest. It was happening. His dream was coming true. He watched the flash from the muzzle of the man's revolver and felt the puppy break free. The dream was playing out for real this time. He felt the slug enter his chest, throwing him back against the side of the shop. A second shot rang out and JD watched the man crumple to the ground. He glanced down at the growing circle of red on his shirt and smiled. It's fate. Kismet. He blinked and looked up at the sound of someone calling his name again. Oh no, please, he wasn't supposed to see me die. JD's knees buckled and he began to slide down the wall of the wooden building, feeling the slivers as they reached out, pricking his shirt and skin as they tried to hold him up. Then arms wrapped around him, stopping the slow-motion fall to the dusty ground. He gasped. The last thing he heard was the sound of Wilmington's voice, swearing at him as his eyes slid closed and blackness engulfed him. unless I'm in hell. Guess that's where I'd be though, right, Lord? I did break a few of your laws, didn't I? Slowly, other sensations besides the pain began to break through to the young sheriff's consciousness. He lay quietly for a moment, trying to get his bearings. He could hear the sound of his own labored breathing, feel the tightness of the bandages that clung to his chest, and smell the faint traces of charred wood that hung in the air. He forced his eyes open. Buck sat in a chair next to the bed. His eyes were red and dark circles testified to the sleep he'd lost. That was confirmed by the way the man's body sagged wearily in the straight-backed chair. In Buck's hands was a worn copy of the Bible, and he was staring absently at the cover, his thumb rubbing methodically back and forth over the title. JD watched him for a moment before he whispered, "Buck?" Wilmington's head jerked up. "JD?" He slid onto the bed, staring at the wounded man in disbelief. "Thought I was dead . . . thought that dream had come true." "We all did," Buck whispered, blinking back tears. "Seems like you had an honest to God miracle happen to you, kid." The perplexed look that crossed the young man's face prompted Buck to continue. "That puppy wiggled free just as that man fired. The pup was hit first by the bullet and deflected it just enough so it didn't hit you square in the heart. It sort of bounced off your ribs. The doc said it was a miracle; nothin' else could explain it." 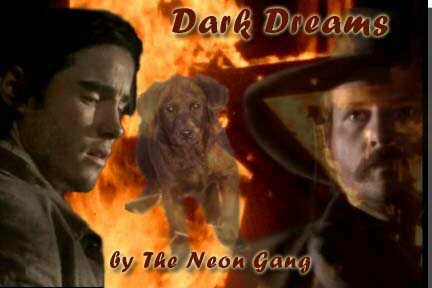 JD closed his eyes and recalled the flash of wiggling pup that had passed in front of him just after the flash from the gun. Thank you, Lord. I don't know why you spared me, but I do thank you. He opened his eyes and looked down at the Bible the ladies' man still held. Buck looked down at it as well, his cheeks reddening slightly. "You know, kid, I don't know what to think anymore. You should've been dead, and after the dreams and all, maybe it is a miracle." "Maybe so." JD let his eyes close as his friend's hand reached out and gently gripped his shoulder. It didn't really matter anymore. He was alive and Buck was okay. That was all that really mattered. "Surprised they even had a Bible in a place like this," he added in a whisper. "Hell, kid, place like this needs one more 'n most. And I just want ya to know, Abigail's just dying to see you once the doc says you're, uh, up to it." "Abigail?" JD asked, not bothering to open his eyes. "That pretty little blonde gal who took a shine to you; I think she's the Mayor's daughter." crap," he muttered, sleep carrying him away, but not before he heard Wilmington's reply. "Yeah, I guess I am, but I wanted you to have the best, kid  only the best."